The V-Fit MTT1 Mini treadmill is designed for users who are looking for an entry-level treadmill for walking and light jogging, perhaps to supplement their current exercise regime or to begin a healthier lifestyle. The small size of this treadmill also makes it a good choice for people who are short on space and/or don’t want to spend a fortune on expensive fitness equipment. The V-Fit MTT1 is well rated on Amazon and other on-line retailers with many 4 out of 5. It is also currently one of the most popular manual treadmills. Assembly is relatively straight forward, especially when compared to some of the motorised treadmills and takes about 15-20 minutes to set up. Unfortunately there is no extra delivery option to have it assembled for an added cost like some other treadmills. Once assembled the V-Fit MTT1 takes up little space and folds away to a compact size. It is also designed so that the running deck won’t fall down when in the folded up position which is good to avoid accidents (especially when young children bump into it). The MTT1 features a single screen LED display that has functions to display speed, distance, Time, and calories burned. These are useful to have if you are looking to make improvements to your workout and keep track of your progress, which can also help keep you motivated. 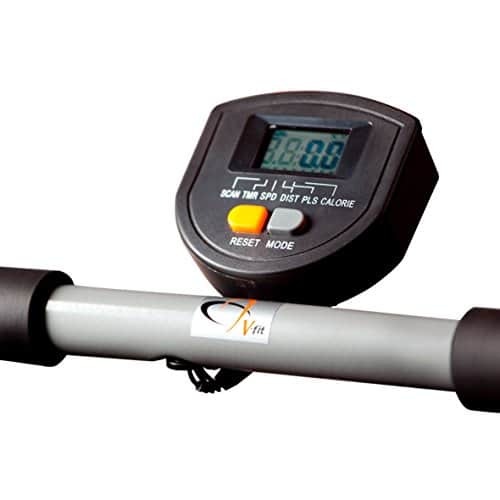 The incline is set to 8% as standard and is not changeable which can normally be done with other models. However it is worth noting that this incline significantly affects the difficulty of your workout compared to running/walking outside. Even experienced runners will be able to push their limits. As with most manual and motorised treadmills they can be a bit noisy, the V-Fit MTT1 is no exception, but hearing the radio or TV is not a problem. Manual treadmills are generally quieter than motorised and the lack of motor has the added benefit of having one less thing to go wrong. 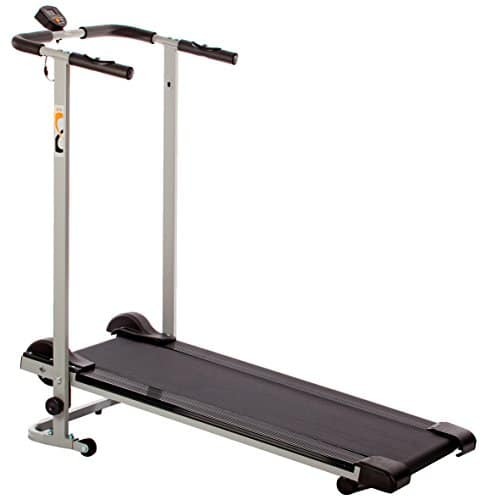 The V-Fit MTT1 Mini treadmill has a frame composed of tubular steel and has an epoxy powder coating to prevent rust. The quality of the components is reasonable especially considering the price of the product. It also feels stable when being used, but always make sure to have a suitable flat and level surface to site it for best results. The running deck is on the smaller side, being just 320mm wide by 1009mm long so if you are much taller than 6ft then a larger treadmill may be more suitable for longer strides. However for anyone 6ft or less and weighing under 100kg (15.7 stone/ 220lbs) this should be suitable for you. The running belt is not particularly thick or cushioned in any way as far as I’m aware, but I had no problems with impact stress on my knee joints after 40 minutes jogging and is generally more comfortable than running on tarmac. The running deck seems to flex slightly when being used(as with most treadmills) which probably has an effect on reducing impact stress on the knees. Overall the V-Fit MTT1 Mini treadmill is good for people who are not looking to spend a large amount and are limited on space to exercise at home.It is better suited to users who are 6ft or less, people taller than this may want to consider a larger motorised treadmill for greater stride length. The components are good quality and the product is easy to assemble. We hope you have found this review helpful, the V-Fit MTT1 Mini treadmill is available from Amazon at a good price.